Chichester City are now 10 points clear at the top of the Southern Combination League with just five games to play - but Bognor's season is threatening to blow itself out early. Miles Rutherford's City can almost taste the title after coming from behind to win 3-1 at Lingfield. Kaleem Haitham, Josh Clack and Gicu Iordache got the goals that keep them 10 clear of Horsham YMCA and 13 in front of Newhaven, who have an extra game to play. 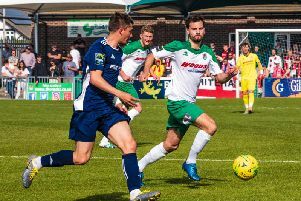 But while City look up, Bognor have all but waved goodbye to their hopes of reaching the Bostik premier play-offs, losing 4-0 at home for the second time in five Saturdays, this time to Leatherhead. Bognor had their moments, hitting the woodwork and drawing a couple of good saves from the Tanners keeper, but ended up well beaten with Jack Skinner and Charlie Hester-Cook giving the visitors a 2-0 half-time lead and Ibrahim Olutade and Travis Gregory doubling their lead late on. Bognor are eight points off the top five with 10 games to play but their recent form is very poor. Back in the SCFL premier, Pagham went down 4-2 at home to AFC Uckfield Town, their scorers Liam Brady and Jamie Horncastle. In division one there was an entertaining clash between two of our local sides at the Rotherfield with Selsey running out 3-2 winners over their hosts Midhurst. Lindon Miller (2) and Ryan Morey scored for Daren Pearce's team while Joshua Sheehan and Harry Giles scored to stage a late first-half fightback for the Stags. Sidlesham lost 1-0 at Storrington. We're short of players - where's our 58-year-old chairman? In division two Bosham had an end to their league season they'd rather forget, with Nick Edgington's goal the only bright spot in a 5-1 loss at home to Rustington. West Sussex League action included East Dean losing 3-0 at Stedham. In local rugby Chichester enjoyed a terrific bonus-point 43-10 win at Hove that moves them up to eighth and well away from the bottom three. Bognor lost 19-10 away to Eastleigh IIs. Get all the football and rugby action in the Observer on Thursday and on this website throughout the week.